Visitors to the Bison Hillock in Rewilding Europe’s Southern Carpathians rewilding area can now enjoy a new, state-of-the art wildlife observatory. Constructed during a 10-day on location “workshop” in August, the striking wooden structure boasts a light, airy design that allows it to blend in with its surroundings. 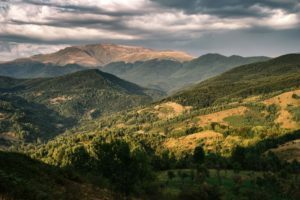 It will provide the ideal space for hosting talks with groups of tourists and youngsters from the local communities, as well as a sheltered place from which to observe the bison and spectacular wild nature of the Tarcu Mountains. 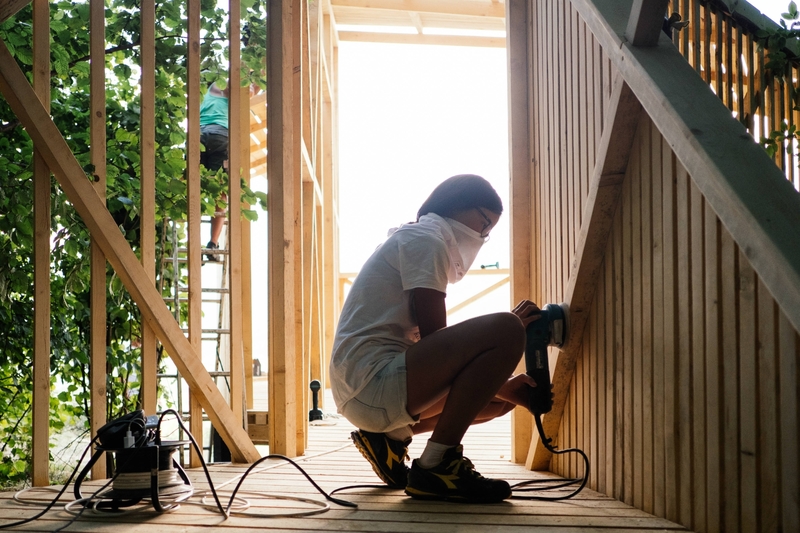 The “design and build” multi-cultural workshop, which saw a talented group of architects and designers from Italy, Romania and the Netherlands gather at the Bison Hillock from August 17 to 28. It was organised by WWF Romania and Italian outfit Camposaz, which brings together young architects and designers in a collaborative way to brainstorm and build innovative, landscape-enhancing wooden installations around the world. 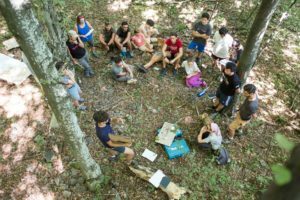 The workshop was carried out as part of the LIFE-Bison project, through which WWF Romania and Rewilding Europe have been reintroducing bison to the Tarcu Mountains (part of the Southern Carpathians) since 2016, with support from the European Union’s LIFE Programme. With wild bison hunted to extinction around 200 years ago, Rewilding Europe and WWF Romania began working to reintroduce bison into the Southern Carpathians in 2013. This year witnessed great success with the birth of three three new bison calves in the reintroduced herds. 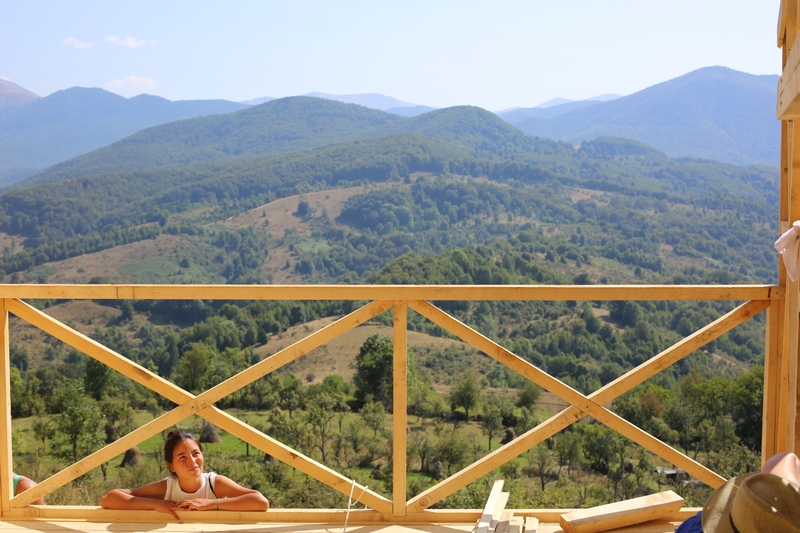 Participants in the workshop stayed in tents at the Bison Hillock, in the heart of the Tarcu Mountains, working every day on the design and building of the observatory. The workshop followed a set schedule, beginning with a phase of immersion in local nature, followed by the translation of creative thoughts into possible designs, actual design and conceptualisation, and finally construction and structural fine tuning of the observatory. 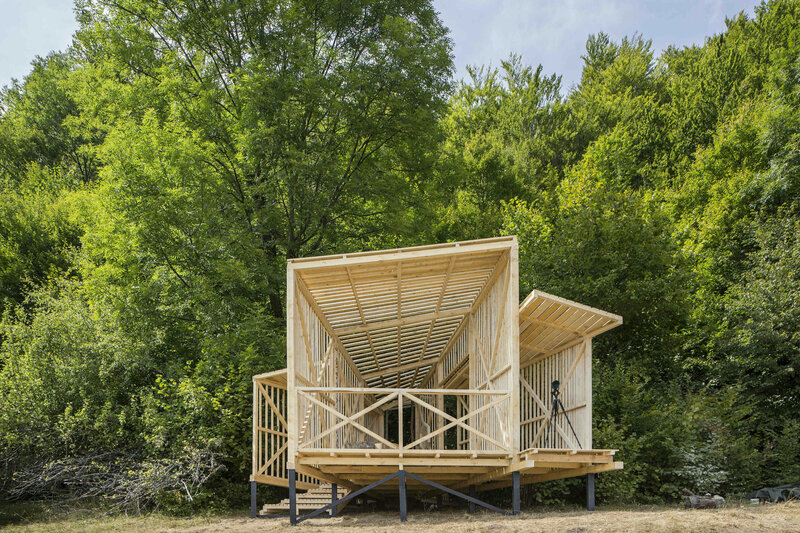 By allowing the creative minds involved to fully understand and appreciate their local surroundings and the raison d’etre of the rewilding project, this methodology enabled the fullest possible integration of the observatory design into the local landscape. The recurring impression left on most participants related one way or another to the transition zone between the forest and the space of the open hillock. This, in turn, highlighted the continual movement of the bison between these two types of habitat, and the animal’s role in nature, forming and maintaining small glades in the forests and fertilising meadows. This characteristic behaviour of the bison was incorporated into the project brief and became one of the criteria to validate the final technical solution of the observatory structure. Over the course of the week, workshop participants also developed and installed a number of informative wooden elements inside the obervatory. These included a timeline of local bison reintroductions, an interactive map of the surrounding landscape, a modular table with symbols of the main pillars of the bison reintroduction initiative (the local community, local products, tourists and the wilderness represented by the bison), and a small installation illustrating the impact of bison on nature and the relationship between the forests and meadows that they create. 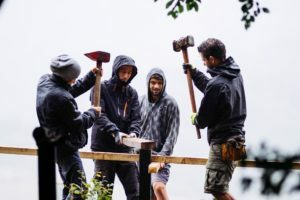 The decision to opt for a collaborative approach to the building of the obervatory reflected the rewilding team’s desire to involve local communities and smaller businesses, and to overcome budgetary limitations through creativity and lateral thinking. 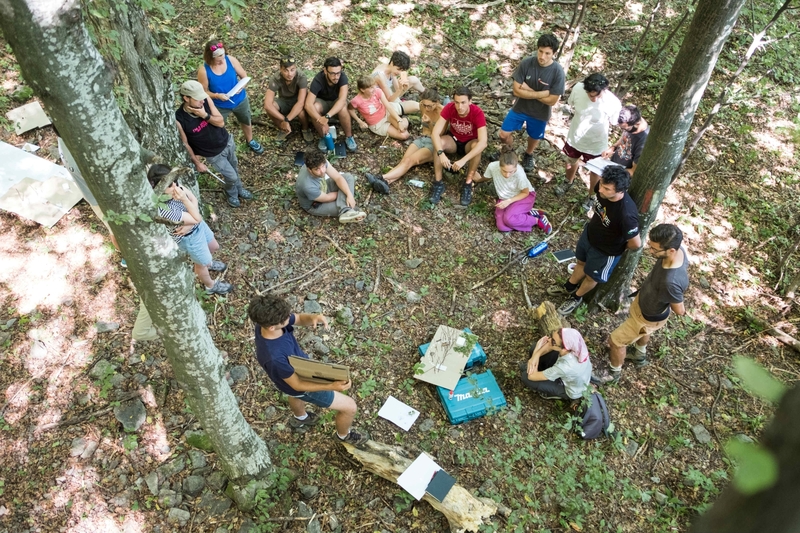 The collaborative philosophy behind the observatory project motivated Camposaz and the rewilding team to ask a range of firms to contribute to the architecture camp with a range of donated products and tools. Rewilding Europe would like to offer a big thank you to Makita and Rothoblaas for the professional equipment they provided, Sabio for the 100% natural Romanian cosmetics, Susai for the responsibly sourced wood, and Three Happy Brewers, Catleya Wines and Olivo Coffee Roasters for the special flavour they gave to camp meals, which were diligently prepared by ladies from the local community with ingredients sourced from more than 10 local producers. We would also like to thank all the local people who offered their help in transporting the participants, materials and food to and from the camp, which was around one hour from the nearest village of Feneș. Without the assistance of these people and companies, the building of the observatory in this beautiful location simply would not have been possible.